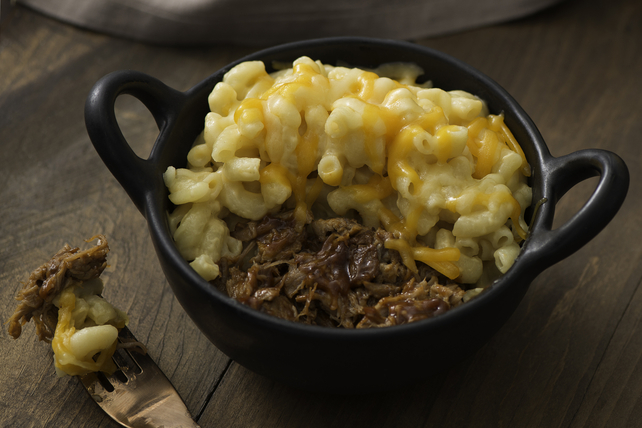 You’re sure to love this pulled pork twist on mac & cheese. It’s the ultimate! This super-quick version of pulled pork, made from pork tenderloin and a bold and spicy barbecue sauce, is the perfect accompaniment to our saucy mac & cheese. Why wait? Try serving it at your next potluck. Place meat in single layer in 2-L casserole dish sprayed with cooking spray. Pour broth over meat; cover. Bake 1-3/4 hours or until meat is done (160°F), turning after 1 hour. Remove casserole dish from oven. Pull meat into shreds with 2 forks; return to casserole dish. Add barbecue sauce; mix lightly. Bake, uncovered, 10 min. or until heated through. Meanwhile, melt margarine in large saucepan on medium heat. Whisk in flour; cook 1 min., stirring constantly. Gradually stir in milk; cook and stir 3 to 5 min. or until thickened. Add Parmesan and 1 cup old cheddar; cook and stir 1 min. or until cheddar is melted. Add macaroni; mix lightly. Remove casserole dish from oven. Heat broiler. Spoon pork mixture into 6 (250-mL) ovenproof dishes; top with macaroni mixture and remaining cheeses. Broil, 4 inches from heat, 2 min. or until cheeses are melted. Prepare and bake casseroles as directed; cool completely. Refrigerate up to 24 hours. When ready to serve, reheat the covered casserole in 350°F oven 25 min. or until heated through. Substitute your favourite Cracker Barrel Shredded Cheese for the old cheddar cheese. Bake meat mixture in casserole dish as directed; top with macaroni mixture and remaining cheeses. Broil, 4 inches from heat, 2 min. or until cheeses are melted.